How many of you go out to dinner and can't ever make up your mind what to order off the menu? I tend to sit down and drive myself crazy with a decision on what to order every time I go out to dinner. I consider myself a "little of this and a bite of that" type of gal. I want to try a few bites of EVERYTHING. I mean, what if I order the wrong thing? As I've told my husband before, "my taste buds get bored... I want it all." It's not uncommon for me to go to a restaurant (sometimes even alone) and order several apps and a dinner entree, particularly when I'm traveling. After all, what if I never get to eat at that restaurant again, and I miss something unforgettable? There's no denying different foods, flavors, and variety is important to me when it comes to my meals. That's why I respect the ever-living heck out of the Spanish. A little thing called tapas exists because of these fine folks, and we are finally picking up on it in the US. That's why I love the concept of a "small plates" or a "bites" menu when I walk into a restaurant. I don't need 100 bites of the same thing... I need 100 bites of several things. I'd like to tell every restaurant out there: GIVE ME ALL YOU HAVE BUT NOT A LOT OF IT! Besides, a "tasting" menu is just so fun. There's something festive about sitting with a group of friends trying little bites with wine sips in between and debating on which bite or plate was the best. 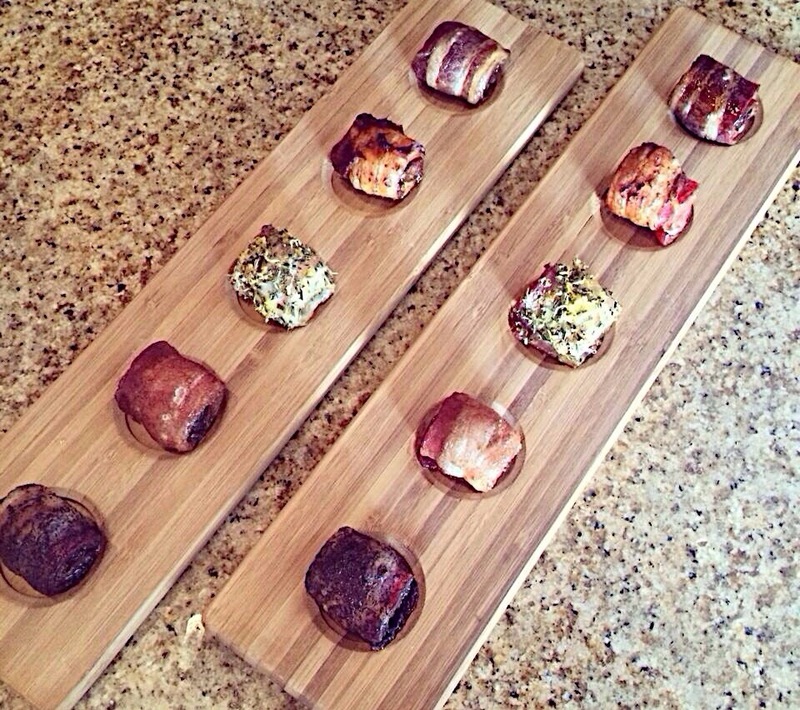 Because bacon wrapped dates have become so popular, I decided it'd be fun to have a "flight" of them - Maple Espresso, Cinnamon Sugar, Lemon Rosemary, Chipotle, and Balsamic Honey. This is so much fun for small get togethers or parties, and you could even have everyone vote at the end. Y'all do this at your next party and let me know which date wins! Make the mix for each date flavor. In the first bowl, mix together the espresso, brown sugar, and maple. In the second bowl, mix together the cinnamon and sugar. In the third bowl, mix together the lemon and rosemary. In the forth bowl mix together the chipotle, chili powder, cumin, and cayenne. In the fifth bowl mix together the balsamic, honey, and vanilla. Wrap the dates. You should have 20 date halves and 20 bacon halves. Wrap each date, and if necessary, you can secure with a toothpick. 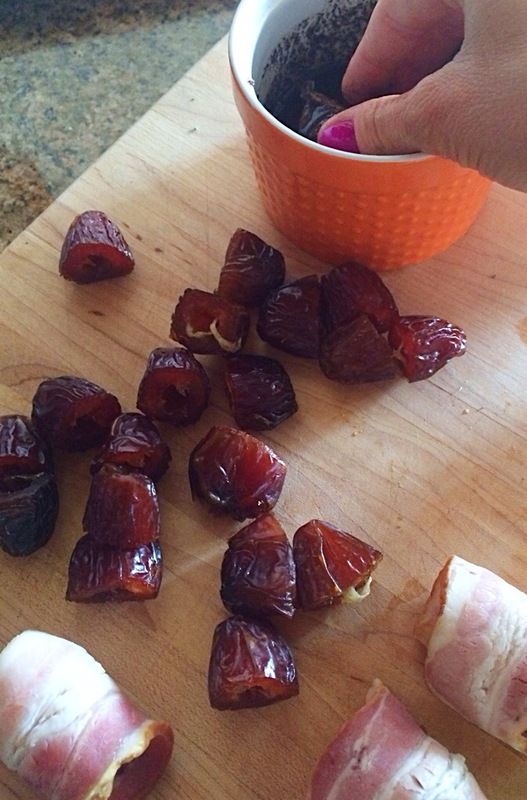 Step 3: Working with one mix at a time, dip 5 bacon wrapped dates into each mix. Completely cover each date, using as much of the mix as possible. Wash hands in between dipping dates into each flavor so they don't mix with the others. Place each flavored date on a piece of foil keeping like flavors together. Place foil sheets on two baking sheets - two on one baking sheet, three on the other. It's important that the foil pieces have a wall around each edge so flavors don't mix (it also makes for easy cleanup). Bake until bacon is crisp, about 15 minutes. I like the plate these individually so everyone has a "flight." Or you can just use five small plates or one large plate with the dates piled. Labels would be fun or you could play a guessing game and have guests guess the flavors in each!